llusionist, escapologist, plate spinner, showman. As well as being a member of the Grand Order of Water Rats Andrew Van Buren is also one of only a few Gold Star Members of The Inner Magic Circle. Andrew as a child grew up touring the world with his parents illusion show & as a family they are famous for inventing & building their own illusions often performed surrounded. Andrew is renowned for his showmanship & is recognised as one of the most experienced, professional & adaptable speciality performers around today. Uniquely combining mixtures of skills including magic, illusions, trick cycling, juggling, escapology & his famous plate spinning - with real plates! 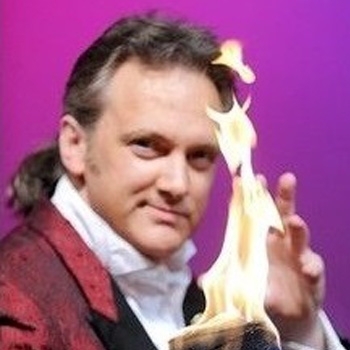 A few of Andrew's notable projects include performing his magic & illusion shows at The Brit Awards, in the Royal Albert Hall, Glastonbury Festival, Blackpool Tower Circus & West End Theatres, also in the Middle East & around Europe. Also headlining on some of the largest luxury cruise liners around the world. Andrew represented Great Britain at World Expo in Seville Spain before HRH Prince Charles & has performed for the Dubai & Sharjah Royal Families. Repeated TV appearances include Ant & Dec's Saturday Night Takeaway, The Generation Game, Judge Jules Spin Cities, Cilla Black's Moment of Truth, The Des O?Connor Show, The Money Programme, The Slammer & Blue Peter as well as on music videos to name just a few. Appearing in special projects with Harry Hill, Paul O Grady, Lulu, Peter Kay & members of TVs Coronation Street. Also making a featured guest appearance on the interactive 360 film of "Behind the scenes of the BBC News studios". Recently Andrew taught TVs Loose Woman & Benidorm Actress Sherrie Hewson the art of plate spinning, presenting it on ITV's "Get Your Act Together" with Stephen Mulhern, Brian McFadden, Penn & Teller, Danielle Lloyd & Ray Quinn - Stephen & Sherrie became plate spinners with smashing results!